You dig, you toil, you reap the rewards. But just how necessary is digging? Have you ever stopped to consider the logic of turning over the soil, season after season, year after year? After all, Mother Nature doesn’t use a spade! It’s no wonder, then, that the practice of ‘no-dig’ or ‘no-till’ gardening is gaining ground with gardeners across the world. In this video and article we’re going to explore just how no-till gardening can save you time and effort – and all while boosting the health and vitality of your soil. There’s no getting around the fact that digging is hard work, but conventional wisdom says it’s worth it. The logic goes that digging helps you to incorporate nutrient-boosting organic matter such as compost, while creating looser, fluffier soil for sowing and planting. But does it? Consider the myriad of soil life that’s disrupted every time we dig, from bacteria to earthworms, ground beetles to fungi. Tearing at the soil disrupts this intricate web of life, setting back the natural processes that lead to healthy soil. Leave soil undug and soil organisms can thrive undisturbed, which is good news for plants. And it also allows for a more natural balance between soil pests and their predators. Regular digging, especially double-digging where the soil is dug to the depth of two spade blades, quickly tires you out. And it’s not great for your back either. So why do it? 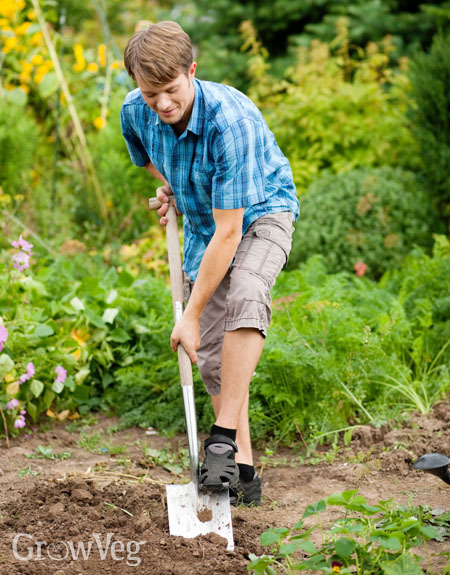 Digging is tiring and it’s disruptive to soil life – so why not ditch the spade? Digging isn’t even necessary when setting out new growing areas. Start by clearing the surface of any debris and any rocks larger than a hen’s egg. Mow down grass or cut back weeds to the ground. Now add a thick layer of well-rotted organic matter. This will suppress the growth of the weeds beneath by blocking out light, and provide nutrient-rich material for roots to grow into. Lay it at least four inches (10cm) deep. Suitable organic matter includes compost, or manure from a trusted source where you can guarantee no herbicides have been used. Fast forward a few months and any grass and weeds below will have rotted down, while earthworms will work to gradually incorporate the organic matter into the soil below. If there are lots of weeds on the ground where you want to grow, lay down a layer of cardboard before adding your organic matter. Thoroughly wet the cardboard to help it break down. The cardboard will serve as a further barrier to weeds, exhausting and eventually killing most of them off. Once the growing season gets underway, you’ll find that any weeds that do manage to make it through will be much easier to remove. Mark out paths between the beds using thick cardboard laid with generous overlaps. This will help to kill off the weeds between growing areas. You can cover the cardboard with bark chips or similar later. If the organic matter in your bed is still lumpy at planting time, start vegetable seedlings off in plug trays or pots to plant out once they’ve grown a sturdy root system. This will also make it easy to space plants out at exactly the right distance, saving you time thinning out rows of seedlings. A common variation is to use materials that are readily available to nourish and build soil. Popularized by organic gardener Paul Gautschi in his ‘Back to Eden’ method, materials such as woodchips are used to mimic Mother Nature’s infinite ability to recycle nutrients. Let’s make a bed using this method. Start by laying a thick layer of paper or cardboard over cleared ground. Add around four inches (10cm) of compost, then add a layer of woodchips about two inches (5cm) deep, taking care not to mix the two layers. Then simply push aside the woodchips to plant into the compost beneath. You could of course use other materials such as leafmold or hay in place of woodchips. The secret of this top layer is to slow down evaporation and constantly feed the soil below, so that no additional fertilizers are ever required. The secret behind any no-till garden lies in regular mulching with organic matter. Mulches cover the soil’s surface, protecting it from erosion, locking in soil moisture and suppressing weeds. As they rot down they add fertility to the soil while at the same time improving its structure, without the need to dig. In no-till gardening, mulching replaces digging. Replace old mulch as it rots down or becomes incorporated into the soil, so that the ground is being constantly fed and gradually built up. Add mulches around mature plants or wait until the end of the growing season. Suitable mulches include compost, leafmold, hay, woodchips, grass clippings, straw and sawdust. Mulches also need to be weed seed-free, so they’re not self-defeating. No-till gardening suits gardens of every size, including small, city plots. Aim for beds no wider than four feet (1.2m) and you’ll never need to step on the soil inside. This helps to prevent the soil from becoming compacted, which lessens still further the need to reach for the spade. Using raised beds is not essential, but the sides do help to contain all that additional organic matter. Over time the weeds in a no-till garden become few and far between as mulches work to weaken weeds by smothering them. And because you’re not digging, weed seeds in the soil below need never come to the surface to germinate. No-till really does save you time! It’s a wonder any of us still dig! No-till gardening is kinder to our backs, the crops we grow, and the precious soil we grow in. If you’re already a no-till convert we’d love to hear from you. What method do you use, and what sort of difference has it made to your gardening? Let us know in the comments section below. "A question regarding using wood chips over compost on no-till garden: woody wood chips leach too much nitrogen from compost and soil while breaking down? " "Hi Paula. Wood chips take up a very small amount of nitrogen as they decompose, so the argument goes they shouldn't be added to the soil as they'll cause nitrogen depletion. However, the effect if very minimal. We recommend not mixing the wood chips with the compost too, so that they don't cause as much depletion from the compost layer. You can push the wood chips aside at planting or sowing time, so that the young plants/seedlings aren't affected. But I really wouldn't worry too much about the wood chips' impact on nitrogen levels"
"Hi Benedict. I am starting to experiment with no-dig on my fairly heavy clay. I mulched my fruit garden (16 trees plus fruit bushes) with 4 inches of woodchips (got free from tree surgeons) 3 years ago and top it up each year. The fruit loves it and I was surprised how soft the soil was when I planted bulbs through it last autumn. The oldest woodchips at the bottom are making a lovely black compost and there are many many worms in that soil. This winter I got several tons of chopped autumn leaves from the council from the local parks and I have covered half the veg patch with a 4-6 inch mulch of them and plan to plant through this mulch in the spring and summer, rather than stack them for a year and them move them again. In the past I have rotovated in all sorts of muck and compost and green manures, so the soil is healthy and has no nasty weeds, but I like the thought of no dig if its kinder to soil life. Any thoughts on using fresh autumn leaves this way?" "I think using fresh leaves in this way would be fine Tony. Over the winter they'll have settled right down to perhaps a half inch thick, so pushing the leaves aside to plant shouldn't present too much of a problem. This is, after all, how nature recycles leaves. The worms will eventually 'dig' the leaves in for you. The only word of caution is that lots of loose leaves could potentially provide ideal conditions for slugs, but I think the benefits probably outweigh any cons. Let us know how you get on with this approach." "Hi, would this work on poorly drained soil that seems to be quite wet most of the time? I'm thinking that as the organic matter is added it would raise the plants up out of water-logged soil? " "It could do, though it is not guaranteed. Certainly adding more organic matter will help to improve the soil so that it drains better and gets less waterlogged. If it is seriously waterlogged though, you may need to look at other solutions first, such as underground drainage pipes." "I'm about to start preparing some no-dig beds in a community garden - it'll be a small proportion of the total (1/4 acre) as we don't have access to such large amounts of organic matter. But just to be devil's advocate here, I'm not looking forward to the back-breaking work of loading compost into a wheelbarrow and barrowing down to the beds - nobody seems to mention that! " "Hi Alison. You're absolutely right about the wheelbarrowing and shovelling on of the organic matter. But it is definitely easier (and quicker) than digging. Worth mentioning, though, that there is still some physical effort involved. Good luck creating your no-dig beds." "You suggest in your article to lay the compost early in winter to let it incorporate over time. Winter here in Southeast coastal US can be measured in days, so I'm afraid that I've let that part go past me. In that case is it too late to simply add a layer of compost to help re-nourish last year's soil, or should I add more pre-prepared organic garden soil (with maybe some organic fertilizer)? I already have starter seed sprouting in peat pots ready to transplant within a couple of weeks. Thanks so much. Angus"
"Hi Angus. Yes, just add a layer of compost to help re-nourish last year's soil. That will really help to enrich the ground ready for your transplants in a few weeks." "What do you do with the finished tomato crop. Ground level prune and add compost on top or pull roots and all? Also how would a no dig person add bokashi directly to the garden? Bokashi is suggested to dig a trench and cover. I was thinking to lay on surface and cover with compost. Thanks "
"Hi Alan. I would be inclined to remove all the roots of your tomatoes too - to avoid any residual disease hanging about in the soil. As regards bokashi, you have a few options. You can add it to your traditional compost bin, fork it lightly into the soil, or add in tenches and cover. I think you'd be fine adding it onto the soil surface then covering with compost - so I'd go with that technique for a no-dig plot." "Thanks for the reply. So forking into the surface is okay for no dig? I tend to take things quite literally. In a no dig garden how much of the surface can you disturb? A couple of inches permissible? " "I have just heard about no dig gardening...my usual soil improvent includes adding grass clippings as mulch during the summer. At the end of growing season i remove the roots and add chopped leaves...throughout the winter i throw my compostatable materials right into the garden, on top of the leaves, and in the spring i rototill it all in and start it all over again...so if i dont rototill this spring (something i would do in the next week or so) do i just spread the 'debris' apart a bit, plant in between, then return the debris, with minimal disruption of the soil? Almost sounds too easy...thanks for any help you have to offer." "Hi Lynne. For no-dig gardening the material laid on top of the soil surface should really be decomposed, so you're able to sow or plant in the ground with ease. You could try what you suggest, but if the material isn't fully decomposed yet my fear is that the ground will be relatively hard and not that fluffy and light, making sowing/planting difficult. There could also be the issue of disease on the only partially decomposed plant material. That said, I don't think there's any harm in giving that method you suggest a go - though I haven't done this myself so can't vouch for its effectiveness or otherwise. Generally for no-dig it's best to rot down lumpy organic matter off-site, in a compost heap, to then add the finer compost as your surface topping." "Thanks for the reply...i do have an off site compost site but it is a hard walk in the deep.snow here in NH...so i will spread the existing compost where i want to plant this fall, with cardboard under it, and let the worms do their thing with it all...i guess i better make a grow plan for next year before "close of business" this year and do it all right next spring.... thanks for your help!" "Going no till this year, creating a pocket garden. The grass will be allowed to grow around the mulched areas, instead of tilling between the rolls as in the past. I'll just trim the grass around my little pockets of mulch. Much of my garden is already perennials, and some of the plants are over 10 years old." "Hi Douglas. I hope your no-till gardening is a success. Let us know how you get on." "Hi. Fantastic article and video as always. Thanks. I would like to know more about using grass clippings and leaves as mulch. Should I use dried out grass rather than freshly cut grass - to prevent grass from rooting again? And for the leaves, is it important to remove fine branches too or can those be in the mix too?" "This is a follow up from my post in January. Using fresh autumn leaves as a mulch has not worked well at all I'm afraid. The leaves were largely oak and where I haven't dealt with them by taking them back up or rotovating in, haven't yet rotted down much at all. I have planted through in areas and the transplants have either been poisoned by the tanins or temporary acidity of the oak leaves (some killed some stunted) or have been eaten by slugs hiding in them. Even crops near the mulch suffered far more than normal from slugs. I thought my established raspberries were an exception, but they are now suffering Manganese deficiency, which I have not had before. Where I resorted to rotovating in the leaves, the crops are doing less well than ususal probably as the soil is suffering a temporary nitrogen deficiency as it tries to break down the leaves. This winter I will do things differently and stack the leaves until they are leafmould and then use that as mulch. No more cutting corners." "Hi Jaco. Dried grass clippings are best - in typical sunshine they only take one to two days to go brown. While they are unlikely to take root again, drying out the grass before using as a mulch makes it less likely to mat together into a less-than-penetrable block. You can leave bits of twig etc in your mulches. They will rot down eventually. That said, if there are lots of twiggy bits it may make it harder to prepare fine seedbeds for sowing, so pick out the larger pieces where you can." "Hi Tony. Thanks for the update, and I'm so sorry to read of the problems you've had. Oak leaves are perhaps a little tougher than a lot of other leaves, which would make them slow to rot down, so processing them first into leaf mould is probably a good idea. As with many things in gardening, you never know until you've tried, and you had the foresight to give it a go, which is commendable. Good luck for the next season - I'm sure your crops will respond well to leaf mould and thrive because of it." "I stockpiled a mountain of leaves from landscaping clean up and turned them with a tractor loader for two years until they broke down into black, crumbly compost. Then I windrowed the composted leaves into rows about 24"wide by 24" high and and covered it all with 6" of straw to control the weeds. I installed two driplines on each row with an irrigation timer. I have never had a garden perform and produce so well and it is truly amazing h ow much my garden is producing!" "Wow - what an incredible set-up you have! Really pleased it's producing such good results for you. It just goes to show what value there is in re-using all of those leaves. Keep up the good work!" "i have tall weeds in the garden should i pull therm all out then putleaves down orcan i crutch them andput hay on top plusleves"
"I would be inclined to cut all the weeds right back to ground level (no need to pull them up - just strim or brush cut). You can then lay the weeds over the ground and then apply your additional organic matter on top. It will need to be nice and thick to suppress the return of any weeds beneath. A couple of layers of cardboard may help in giving an extra layer of weed suppression, before adding your material on top to settle down over the winter." "Is horse manure, mainly dried out suitable . Also dried pine needles, lawn cuttings or other green grass ok. Is the Lucerne used just green grass and can normal soil be added. " "Hi John. Well-rotted/decomposed horse manure is fine, but it must be well-rotted so it isn't overly rich in nutrients that 'burn' the plants. You'll need to make sure that any manure you add is from a trusted source - what you don't want is manure from horses that have been grazing on paddocks that have had herbicides added, which could then affect your crops. Lawn clippings are great as a general mulch. Ideally they will be applied when they've dried out a little, to stop them forming a thick mat. Pine needles can be useful, though they can lower the acidity of the soil so should be prioritised for acid-loving plants such as blueberries. Alfalfa is good both as a green manure/cover crop - dug in while still green to add organic matter - or applied as dried mulch in the same way as hay." "OK so adding a layer of cardboard in Fall/Winter will prevent weed growth (garden has, sadly mint that I'd love to kill off). So I wet that down, AND add the compost on top at the same time? Or wait 'til Spring for the compost?" "Add the compost as soon as you've laid the cardboard in fall/early winter. The compost will help to weigh down the cardboard, stopping it blowing away, and as the cardboard breaks down the compost will gradually get incorporated by the soil's worms." "Hi, thanks for all this info! I'm going to start a no till garden on my lawn. I'm laying down cardboard today to kill the lawn and am then going to put compost (maybe mixed with steer manure?). I don't have any other organic materials yet but am thinking of trying to acquire some straw. I'd like to make leafmold, but seems like that takes years. My questions at this time: 1) Should I lay cardboard under AND over the compost for the winter? This to kill the grass and also smother any weed seeds that might be in the compost? Any tips would be great, thanks so much! 2) Can I just leave lawn in between the beds (the right width for the mower) or should I plan to also kill the grass there and add wood chips?" "Hi Elena. Great that you're trying a no-till garden! Compost, with a little well-rotted steer manure, would be a great material to start with. Straw and leaves can also be good, especially once they've started to break down a bit. You could always put straw and leaves at the base of your beds, then the compost on top. By the time the roots reach down to that level the straw and leaves will be starting to break down, so there's no harm in using these materials as they are. Lay the cardboard over the ground. I wouldn't bother laying it over the top of the compost. The weeds won't grow much over winter, and when they come up in spring as the weather warms, you can simply hoe them off. This way you're exhausting the weed seed bank at the surface, leaving a nice, clean surface for sowing and planting into once you've hoed off any weeds. You can either leave lawn between the beds (wide enough for a mower) and then mow between the beds. Or cover the grass and add wood chips, which is what I have done in my raised beds. The argument for the latter is that the wood chips will break down and feed the soil, which will definitely help the beds either side and build further the rich soil life. Furthermore, thin strips of lawn can be fiddly to mow and look after, though the wood chips would need topping up from time to time. But it doesn't matter hugely either way - do whichever you prefer. Good luck with it - and report back once they're under way to let us know how you're getting on." "Hi there- I am gardening in a new space this year and intend on trying the no-dig method. I am wondering if it is reasonable to lay my mulch (cardboard, compost, hay, exc.) in the spring and plant my crops into it immediately? I have only moved here a month ago, and the area is established with small weeds and grasses. After this season I will be able to mulch over winter and carry on without the weeds. Thank you for your inspiring articles and input!" "Hi Tiffany. You can plant into mulches if they are fine enough and crumbly enough at the point of laying. So planting into compost would be absolutely fine, while many leafy crops and brassicas could be planted straight into very well-rotted manure. Coarser materials wouldn't be suitable for planting directly into, but could be laid around the crops once they are growing as a mulch. Good luck with your new garden!" "I do no dig vegetables in south africa. I alternate the vegetables with planting various cover crops eg rye, vetch, tiller radish, cowpeas, sorghum. When mature these are cut down to form a thick mulch. I then plant the seedlings into this. This greatly reduces weeds, builds organic matter and retains more moisture. Does anyone do this??? Any comments. " "Hello! i am very intrigued by this article! I have recently taken over an allotment which has been left for about 2 years. There were waist high reeds growing which I've cut to ground level and started to dig the all roots out which is a hellish task! They go down several feet and are rope like. Would it be feasible to start the no till method without getting the remainder of roots up? " "Hi Martin. I've not been as thorough in alternative vegetables with cover crops/green manures as you have, but your method certain sounds like it works and is a very thorough approach to building up organic matter in the soil. Good work!" "Hi Helen. There is potential to do that, but it sounds like those reeds go down a very long way and will have a lot of reserves to push through and thwart your efforts to establish a no-till garden. I would be inclined to cover the area with light-excluding mulch for at least a few months first, to weaken the plants as they try to regrow. They can then be cut down again. I think then they'd be weakened enough to begin a no-dig approach." "Hi Ben.Thank you for your positive comment.This is such a dynamic and interesting site. " "Hi, I have another question! I planted rye seed as a cover crop in my no dig garden (first year). I'm slowly starting to realize that I'm going to have to turn it in. I hate that I'll have to turn in the top layer on my first year doing a no dig garden but I don't think I researched this as fully as I should have. Another thought I had was to cover the rye with a tarp and try to smother it, and then lay compost on top. I don't know, though. It's pretty hardy looking! Any advice for me? Thanks so much!" "Hi Elena. I seeded stooling rye as a cover crop in the autumn. Before it goes to seed I crimp -flattened it. I made a wooden plank approximately the width of the bed, about 20cm wide, with a rope attached at each end. On the plank I screwed on a length of steel angle iron with a sharpened edge. Then I stand on the plank to flatten and crimp the stalks, approximately every 30cms. With the angle iron contacting the rye. The crimping helps to retard any regrowth. Or you could just cut it up into fairly long pieces down to the soil, with clippers. I have planted seedlings into the flattened stooling rye. Commercial no-till farmers who plant cover crops often pull a crimping roller at high speed to crimp and flatten the cover crop. They have blades fitted in a chevron pattern. Their advantage is the weight of the roller." "Wow! Thanks so much for the response. The home made crimp-flattening thing is way beyond my scope. I'm not a handy person. Also, I planted this rye late and we have had a very cold winter. It only grew a few inches but it's very thick. I don't think I would really be able to cut it because it's so short. Hmm... I wonder what I should do? Should I try smothering it? Thanks again for your advice!" "A question for Ben. I see that Grow Veg is UK based. The raised composted beds that I see in the photo do not have any protective muich cover on top, just the vegetables. Do you not need soil cover because of the maritime UK climate? Compared to South Africa, and where I live, where we get an average of 840mm per year, but occuring mainly in the summer months with dry winters.Today the temperature is 32C, and we can experience these temperatures for 3,4,5 days and then often a thunderstorm with rain. Therefore am I right in the assumption that in Europe and the UK, that is why there is not the need for cover crops. " "Hi Elena. You could mow down the rye as close to soil level as possible then cover it with cardboard to exclude the light, with a mulch of compost on top of that. Leave the rye covered for at least a month (preferably longer), then cut holes into the cardboard to plant directly into the soil below. If the rye has completely died, you can just remove the cardboard entirely then sow or plant as normal." "Hi Martin. In cooler, wetter climates such as Britain mulching actively growing crops is considered less urgent (though still welcome) as evaporation rates are much lower. Mulches can sometimes offer hiding places for slugs too. That said, as a general rule, mulching is always good to have a beneficial effect, in any climate, as it helps to improve soil structure and gently feed the crops you are growing. Cover crops are useful for keeping soil covered over winter and building up organic matter in the soil once they are incorporated into the soil. We tend to grow them outside of the main cropping period, though many people grow low-growing cover crops like clover in among their vegetables." "So nice to see someone is copying my no till garden! My garden area is 20×40'. This year I will begin to add a bench and flower area to about a third of it. Each Fall after harvesting veggys all Summer, I lay down cardboard and overlap as much as possible then apply pine straw over it. I keep my rows marked at the ends so I know where to plant in Spring. Usually shortly after Mothers Day I cut through the cardboard and add worm castings, ground eggs, banana, etc. and plant my seeds or veggys plans. I have to pull some weeds but it is mostly onion grass around the parameter......using cardboard keeps my work to a minimum. You just always have to be on the lookout for all things cardboard. I keep a plastic bin of garden dirt in the garage and once a week add my coffee grinds to it. Less frequently I add ground egg shells to the bin also and i use this in my potted plants and garden. I also give the ground egg shells and some of the coffee to my worms." "Thanks for sharing your experiences. It sounds like you've got a really good system going there. " "I am new to no-till gardening. I have been organic gardening in containers. I use a home made organic soil mix. Each spring I remove about 20% each and amend that with worm casting and mold /bacteria starter. Just recently I read tilling/turning over disrupts the soil food web.So...is it better to just leave the old roots and snipped stems, amend by adding on top or the old way and remix? " "Hi Mark. I think in the case of containers it's probably best to remove the old roots by digging them out/turning over. This is because containers won't have as much soil life in them as the actual ground. The old roots etc. won't break down as quickly in containers therefore. I'd be inclined to carry on as you are. But this is only my opinion. I would be interested to hear what others have to say on this." "Hi Ben, what is the best practice after the previous growing season with a no-till raised bed garden? At the end of last year I just chopped off all plants close to the ground then chopped the bodies/stems into a mulch and covered with leaves for the winter. This spring I pulled up those old left over stems and root balls which were like super-dense, fine root masses. If these are left undisturbed, is there enough soil space for a new plant to thrive with the previous roots not fully composted? Thanks for any input." "Hi Roth. I usually clear away the old crops by simply pulling them out at ground level and removing everything to the compost heap. Then I add my layer of organic material for the winter. Yes, there is some disturbance of the soil but this is really very minimal with most crops. You could leave the plant roots in the soil as you did, but there is a risk of some disease carrying over in the soil, and of course larger rooted planted may take a while to rot down, though they should have mostly done so by the time you come to sow again in spring. " "I understand planting transplants in no till but how do you handle crops requiring direct seeding? Corn, carrot, beet, radish, etc.? I use heavy mulching instead of hilling potatoes and then use a middle buster on a compact tractor to dig then. How do you suggest handling the resulting uneven surface? I plan on squash and pumpkin on the plot where the potatoes were last season. " "It's a lot easier to plant out transplants into no-till beds. Then there's no issue with bumpy or uneven surfaces. If you want to direct seed - for example radish or carrots - then perhaps move off the mulch along where the drill will go then lay a layer of fine-textured potting soil or well-rotted compost in its place, to sow into this. But most things are easy enough to transplant and will remove any need for thinning."